THANK YOU, educators and parents! You make a such difference... You are shaping the future for everyone, and yet, some days, it feels like you are trying to save the world... with only a toothpick... on the Titanic! If you feel exhausted and overwhelmed, you are not alone. You can prevent burnout, bullying and overwhelm. Imagine kids who can calm themselves quickly and easily. Imagine kids who are calm, caring confident, and cooperative. Imagine kids who are focussed, self-motivated and engaged in learning. Dare to dream of children with the social-emotional success skills to solve many of their own problems, and prevent conflicts before they even happen. Maybe you’re wondering who I am and why you should listen to me. Hi, my name is Sharon Love, M.Ed.. Ever since I taught my little sister how to read when I was nine, I wanted to inspire and empower kids. I was going to make learning fun. I was going to create caring classrooms. I was going to changes lives. I spent years studying to become a teacher, finally got a job teaching French, and quickly burnt out. I was dealing with 34 kids per class, textbooks that the kids couldn’t begin to read, kids with ADHD, LD, crack babies, trauma, bullying, open concept classrooms with constant overwhelming noise, parents who didn’t want their kids to learn French, and not a single teacher’s aide. I was exhausted and overwhelmed most of the time. My health was crushed. I just could NOT continue. It broke my heart. So I went on to earn a Master’s degree in educational Psychology, and got a job as a bilingual Psychometrist for a large school board. In that role, I worked with 5-year-old boy who was beating up smaller children, because he was imitating his favourite superhero. I realized that this boy needed better superheroes, who solve problems with skills rather than violence. In fact, I realized, most of our world leaders also need better superheroes if the we as the human race are to survive, let alone thrive. That’s why I created Super Peace Monkeys(TM). Imagine having 30 fantastic teachers’ aids or nannies to help you every single day... all for free! 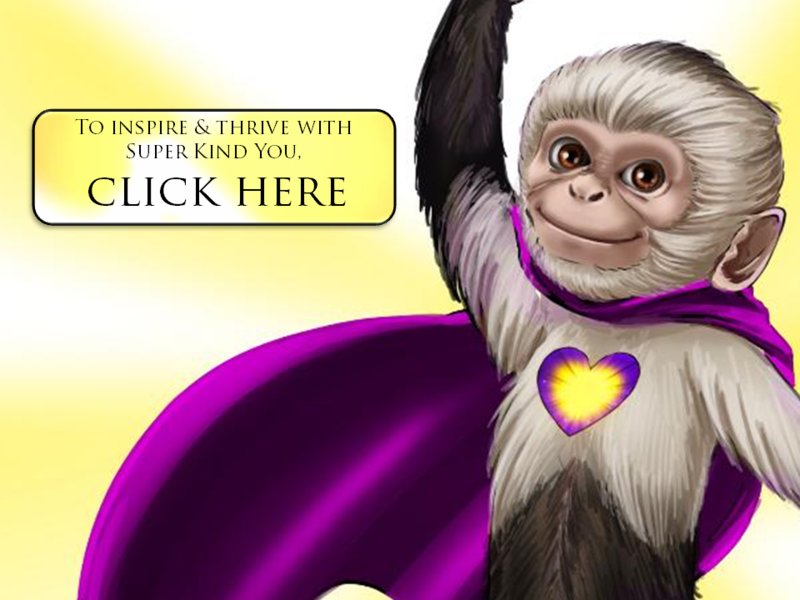 You can get a free social-emotional success skills kit simply by putting in your email at SuperPeaceMonkeys.com . We will protect your privacy. You will get free e-books, games, videos and other resources to help you to teach, inspire and thrive. Thanks! You make a difference. Together, we can create successful students, caring kids, and a kinder world.